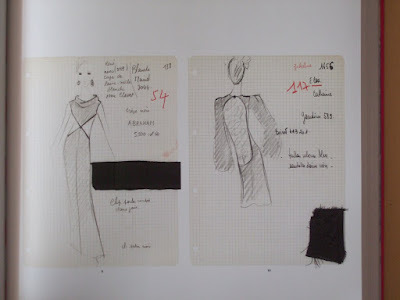 The Magda Berliner dress at left seems to take its cue from YSL's 1970 design currently on display in Montreal (below). I'm not sure if I prefer the look of ribs or hipbones exposed through windows of black lace, but the latter makes me curious about what sort of undergarments would be possible. The ensemble at right I very much wanted to wear to Batman: The Dark Knight last Friday. 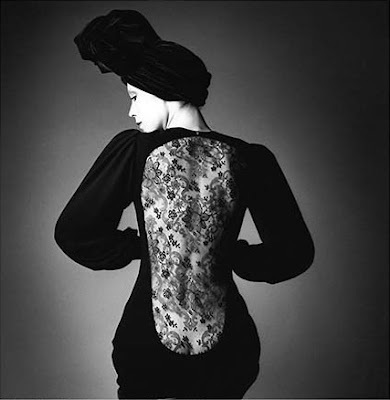 Update: The YSL dress above in a photograph by Jeanloup Sieff. haha...good point about the undergarments. i don't think these dresses were created with them in mind! loving the one of the left. the one on the right, i like the top half. not too crazy about the poufy skirt though. think i would have prefered it streamlined and fitted? that would be perfect for batman... which i'm dying to see. hopefully they play it in the english speaking cinema. Quite right. I'm more of a streamlined than poufy beast myself. Mags... it's taken me a while to sort that out, but I usually cut out the pages I want and file them (or post on my mood board). Issues I'm not willing to rip up are lined up on a bookshelf. jennine: Hey, I loved the picture of you, Mahret and Mary in Berlin. Saw it on F&ART last night. I have the thing too! I love tho get over-dressed when going to the movies. You really need to put some feed buttons on this blog. Wow, i think those dresses are gorgeous!! The photograph is lovely, and so is the dress. For more great looks, take a peek at www.sophomorenyc.com . I love their dresses! the above dresses are very chic too. The dress to the right definitely has a 'bat look' so would be great for Batman! i like this outfit alot! i love those 1st 2 dresses. actually the hip exposing version the most. and in love with all things paneled with or using lace inserts. it's inevitable. it's too lovely. Love it or hate it, you certainly can't accuse this dress of being drab or uninteresting.